I was born in Brooklyn, NY, but I consider Texas as my home. My humble beginnings started back in 1980 when my father opened Joe’s Pizza, and although I was young, I was old enough to help our family business. In 1985 we moved to Texas, opened another Joe’s Pizza and I spent many years working side by side with my father; listening and watching him build his business in a community that he loved. After school, I joined the US Marine Corp and proudly served for over 16 years, did multiple tours overseas and lost many of my military brothers while defending our freedom. I love my country; I wouldn’t do anything different if I had a choice to do it all over again. Before my last deployment, I met my beautiful wife Hanifa, and I knew my life would never be the same. A few years later we were blessed beyond words when our twins Angelina and Benjamin were born. They are now 8 and bring such joy to our lives. 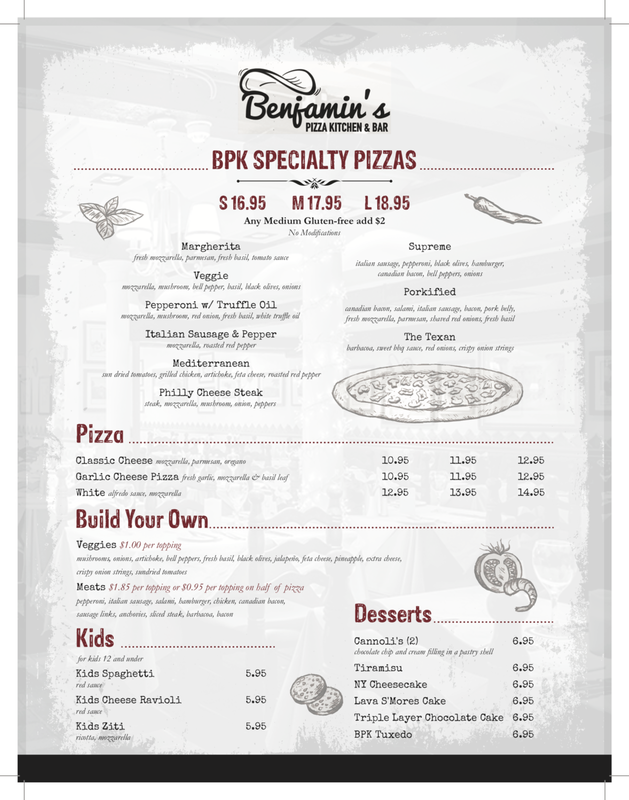 Benjamin’s Pizza Kitchen was founded in March 2017, named after my son, and is my 3rd restaurant concept. BPK has truly been my passion project and took years to plan. I wanted to create something special using our family recipes that Benjamin and I could one day make together, just as my father and I did. Thanks to our wonderful patrons, our business is steadily growing and we will proudly serve 76262 and the surrounding areas for many years to come. Call (682) 237–7707 from 11a – 10p daily, or e-mail benjaminspk@yahoo.com.